Will CBC finally lose its Don Cherry? You are here: Home / Media / Will CBC finally lose its Don Cherry? Because he would like to destroy it eh? But there could be a big consolation prize. 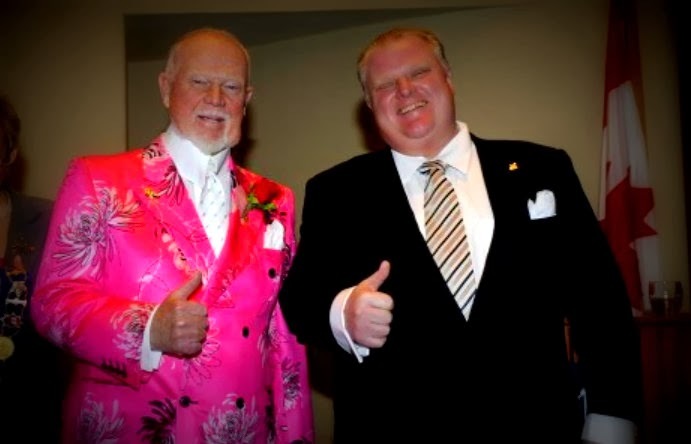 It could be the end of Don Cherry. The long era of Coach’s Corner, which has run more than three decades since Cherry arrived at the CBC, appears to be approaching its coda . . . Cherry, who turns 80 in February, plans to use his Saturday night pulpit to reveal his feelings on the tumult of change – but the public utterances of the new bosses do not bode well. Which would turn me practically pink with pleasure eh? Not just because I can’t stand that revolting Con redneck. That friend of the Ford Nation. Or hate what he has done to hockey. Or his ghastly Coach’s Corner. For the better part of the last decade, Don Cherry’s HNIC has become an advertisement for the Canadian Armed Forces and the government’s foreign, imperialist adventures. 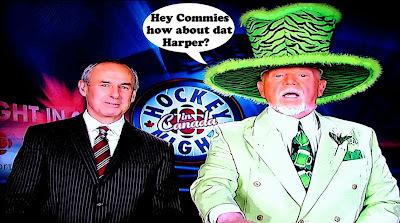 Under the auspices of hockey commentary, Cherry has been given a platform to vent his xenophobic, pro-violence and sexist rants without consequence, and the more unhinged he became, the more CBC decided they needed him. His offences number far too many to catalogue here, but you could do worse than start here, here or here. But also because I hate how the CBC has pandered to him and other obnoxious right-wingers like Kevin O’Leary, and in the process dumbed down its entire programming. The CBC has mistaken Canadians for airheads, feeding them silly reality shows such as Battle of the Blades and Dragon’s Den, and sitcoms and dramas as weak as they are forgettable. Does it figure the lowest-common-denominator approach is the only way to compete and justify its $1-billion subsidy? Until even its once respectable news shows have become frothy second rate versions of what they once were. Discussion panels are no longer forums for spirited debate but marketing vehicles for self-important talking heads promoting their own brands . . . Thoughtful political debate is verboten today. Mindless cheerleading is de rigueur. So hopefully this new hockey deal will help the CBC raise its sights, reboot or reimagine itself. And understand one thing: Cons will ALWAYS hate it no matter what it does. And its true friends, those who support public broadcasting like I do, want it to stop pandering to the right-wing rabble. And there can be no better start than by firing Don Cherry. Yup. Bye Bye pinko pimpo. Bye Bye redneck. And then for chrissakes GO. Thirty years is more than enough. And just like your buddies Stephen Harper and Rob Ford. Your time is finally OVER . . .